In this new book, best-selling health writer Larry Trivieri Jr. has created a clear and simple guide to understanding how the nutrients in coconut work and how you can best employ the different coconut products now on the market. The book begins with a history of the coconut’s use. It then discusses the science behind the fruit’s beneficial effects on the body, including the latest research regarding its impact on brain function. The chapters that follow focus on specific health concerns, from heart disease to high blood pressure to memory loss. Each chapter presents a description of the problem, how coconut works to combat the condition, and important considerations during treatment. This is followed by recommendations regarding the most appropriate form of coconut and proper dosage. Also included is a resource section that guides you to available coconut-based products. History has taught us that certain foods can be a boon to good health. Both history and medical research have proven that the coconut is one of these valuable foods. With no side effects, coconut products provide an inexpensive and safe way to enhance your health and improve your everyday life. Larry Trivieri, Jr. is a leading writer in the field of holistic and alternative medicine. He is the author or co-author of more than 20 acclaimed books on health, including the bestseller The Acid-Alkaline Food Guide, The American Holistic Medical Association Guide to Holistic Health, Health On The Edge, and Juice Alive. In addition, he served as the editor and principal writer of both editions of the landmark volume Alternative Medicine: The Definitive Guide, and has also published more than 200 health articles online and in leading publications. He is also a frequent lecturer on health-related topics, and has been a featured guest on television and radio shows nationwide. Throughout history and in cultures all around the world, the healing properties of foods and herbs have been widely recognized as one of nature’s most important gifts to humankind. Two thousand five hundred years ago, Hippocrates, the renowned Father of Western Medicine for whom the Hippocratic Oath was named wrote, "Let food be thy medicine, and medicine thy food." This sage advice was followed by healers and physicians for centuries before being supplanted by the advent of modern science and medicine’s shift towards drug-based therapies. Today, few conventionally trained physicians know much, if anything, about the healing properties of foods. This fact may seem surprising, yet the reality is that the average amount of time that physicians spend learning about diet and nutrition during their eight or more years of medical school is only twenty-five hours over that entire time period. You can learn more about the importance of diet and nutrition simply by reading one or more books on the subject, including some of my own titles. The irony of conventional medicine’s reliance on drug-based medicine is that the word drug itself is derived from the Dutch word drogge, which means "to dry," as traditional healers often dried plants in order to prepare them for medicinal use. Also ironic is the fact that approximately 25 percent of all pharmaceutical drugs used by physicians today are derived from plant foods and herbs. One very common example of this is aspirin, which is derived from the herb white willow bark. Other examples include the heart medication digitalis, which is derived from the foxglove plant, and the gout drug colchicine, which comes from the autumn crocus plant. Also noteworthy is a study conducted by the World Health Organization that found that 74 percent of 119 pharmaceutical drugs derived from plants directly correlated with the ways the plants themselves are used medicinally in their native cultures. There is a big difference between how plant foods and herbs are used to heal compared to pharmaceutical drugs used for the same purposes. By and large, researchers at drug companies seek to isolate and then synthesize what they regard to be the primary active ingredient in plant foods and herbs in order to develop their drugs. In doing so, very often the various other ingredients found in plant foods and herbs are ignored or discarded, even though these other ingredients also play important roles in the plant foods’ ability to promote healing. Most nutritional and herbal supplements on the market today also contain a single active ingredient. And while the risk of serious side effects, let alone death, caused by the use of nutritional and herbal supplements is extremely rare, the effectiveness of single ingredient supplements is often not as great as when the ingredients are obtained from food, along with their supporting co-factors. For example, many people today are taking a vitamin B6 supplement to combat stress and/or to have more energy. While B6 can be beneficial for these purposes, it is more effective when obtained along with a full spectrum of B-complex vitamins, each of which works synergistically with the other members of the vitamin B family. Foods that are rich in B vitamins, such as beef, liver, eggs, nuts, and certain dark, leafy green vegetables, such as spinach, typically contain most or all of the B vitamins, along with various other B-supporting co-factors and other vitamins and minerals. Moreover, the B vitamins found in such foods are far more bio-available, meaning the body is better able to assimilate and make use of them than it is able to utilize synthetic B vitamin supplements. This is but one example. The bottom line is that ongoing research in the fields of diet and nutrition continues to prove that Hippocrates was right: When it comes to our medicine, foods grown as nature intended really are our best choice. Which brings me to coconuts. Few foods rank higher than coconut as a complete food source of essential vitamins (including B vitamins), minerals, proteins, carbohydrates, healthy fats, and fiber. This fact alone helps explain why coconuts have for centuries been a staple food in the tropical regions of the world in which coconuts are found. Coconut water, the liquid found inside coconuts (which is not the same thing as commercial coconut water products, nor coconut milk, although the terms are often used interchangeably), is also rich in nutrients, including electrolytes. These elecrtolytes regulate the electric charge on your body’s cells and the flow of water across their membranes, and also carry electrical impulses from the nerves that control your body’s tissue function and movement. Electrolytes need to be replenished whenever we perspire heavily, making coconut water an ideal, refreshing drink following times of physical activity, especially in hot weather. * The history of coconut use as a healing aid in the tropical regions of the world in which coconuts grow. * The reasons why coconuts, as well as coconut water, milk, oil and flour, are so good for you. * The healthy fats that coconuts contain and why they are so important to good health. * How and why coconuts can protect your heart and improve blood pressure levels. * The ways in which coconuts can aid healthy brain function and the promise it holds for helping to prevent, and even possibly reverse, dementia and Alzheimer’s disease. * How coconuts can boost your body’s immune system and help fight infectious disease. 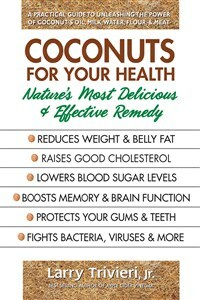 * Coconut’s valuable benefits for healthy weight loss. * Why adding coconuts and coconut oil to your diet can help banish fatigue and make a big, positive difference in your energy levels. * How coconuts can help protect against diabetes. * The uses coconuts and coconut oil have as a beauty aid and as an aid for healthy teeth and gums. * Why coconut oil is one of the very best oils for your cooking and baking needs. * Why coconut flour is valuable as an alternative to wheat flour now that so many people are suffering from gluten sensitivities. And I’ll also share with you what you need to know and look for when choosing and using coconut products, as well as the best sources for obtaining them. So, if you are ready to discover the centuries-old healing secret of the tropics, keep reading.